Once again we have arrived at the official Holiday Season. It is three days until Thanksgiving which this year also marks the first day of Hanukkah – a joint festival that no matter what year you were born, will not recur in our lifetime. In four days we celebrate the annual Black Friday Shopping Extravaganza, and one month from today will be Christmas. 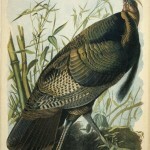 The Wild Turkey, here depicted by John James Audubon, is native to North America, and played an important role in Native American cultures by providing meat, eggs, and feathers. 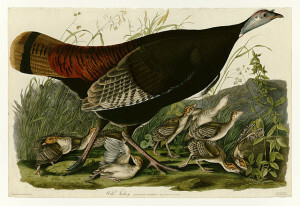 Native Americans burned down portions of forest to coax turkeys into the resulting meadow. 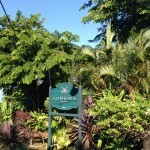 Here the birds were easily hunted. I bet you thought I was going to start talking about Pilgrims. But no. I’m going to talk about Domestic Turkeys. These are the ones we feast upon. Their family tree begins with the Wild Turkey, which indigenous peoples in Mesoamerica developed into a new and improved species. 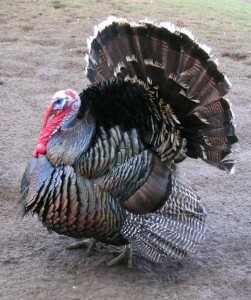 The Spanish took this domesticated turkey to Europe. At this point you might wonder why the bird is call a ‘turkey’. One source says that ships traveling to England from the Levant (Turkey) via Spain brought the new food. – an instant hit, by the way. So the English called the bird a turkey. Next thing you know, the English send domestic turkeys with the colonists setting up Jamestown in 1607. The Pilgrims don’t found Plymouth until 1620. So it is possible that, when they ate at all, the Jamestown colonists ate Domestic Turkey while the Pilgrims ate Wild Turkey. And neither bird looked like the meaty versions we see today. But a turkey is more than a food source. Writing to his daughter in 1782, no less a personage than Benjamin Franklin regretted that Congress had chosen the eagle as the national symbol. Franklin did not think much of the eagle, but waxed poetic in his praise of the turkey. Perhaps it is this indigenous nobility that has made the turkey a symbol of our collective national meal. 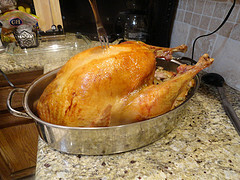 On Thanksgiving, vegetarians often arrange tofu to resemble roasted turkey. Whatever your menu … Wherever you eat … Have a wonderful Thanksgiving.